BIG SALE!! 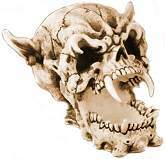 SKULL & SKELETON FIGURINES BIG SALE!! 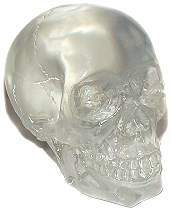 Clear skull figurine looks just like a AA Quartz Skull at a tiny fraction of the cost! Ancient Quartz Crystal skulls found in Mayan, Aztec and other archaic tombs and ruins are priceless. Psychics believe them to be healing tools and crystal "recorders" that stored vital knowledge. Lucite Clear Crystal Skull in two sizes. 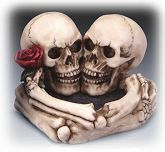 Till death do you part and more... Love Skulls trinket or utility holder has artistic, antique aged appearance. Use it as a trinket holder or utility holder for rings, coins etc. Hand painted cold cast resin figurine packed in glossy gift box. 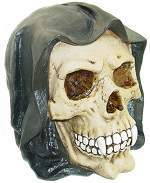 Almost life size fanged Grim Reaper Skull head figurine and secret savings bank is finely hand painted in textured black and creepy zombie hues with hollowed out eye sockets. Beautifully packed in a glossy skull and bones designed gift box. 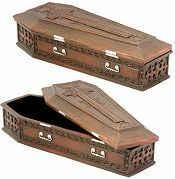 Large vampire coffin can store your secrets and precious keepsakes in this authentic looking old world gothic box. This box is hand finished cold cast resin with a felt covered non scratch base. 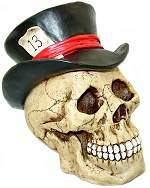 Mad Hatter Skull has his unlucky number close at hand. Detailed hand painted cold cast resin figurine, packed in glossy black gift box.